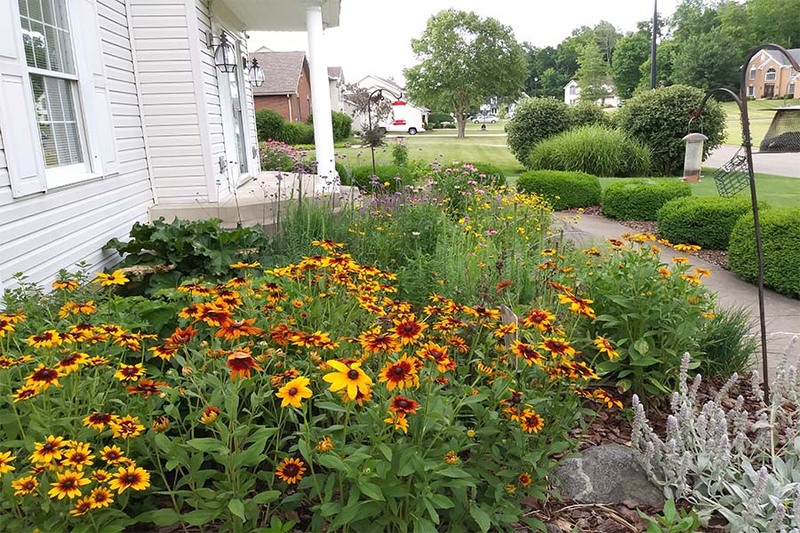 Tricia’s gorgeous Black-Eyed Susan plants, which reseed wonderfully every year. The beauty of a Prairie Garden! No matter where you live, in the city, suburbs, or countryside – you can find a way to garden. I think that is why we love Tricia’s story below so much! Tricia found a way to take some rocky, clay-like soil and turn it into a home-grown prairie oasis. But what makes it even better is that she adds a little of her own flair with plants like Lavender, that she simply loves to look at. I think that is what makes gardening so special – it is whatever you want to make of it, and whatever you enjoy looking at. And for Tricia, she has created a home-grown prairie garden that is simply gorgeous! I grew up in Northeast Ohio, but after I got married I lived in Champaign/Urbana Illinois for 18 years. During my time there the state of Illinois, and especially the Champaign/Urbana area, began making an effort to restore small parts of the tallgrass prairie garden in many of the open spaces around the city and along the highways. I got a chance to learn about and appreciate the plants that made up the tallgrass prairie and I came to love many of these flowers. Ten years ago I returned to my birth state of Ohio and moved into a house that had a rather large garden area in front of the house. It was filled with rose bushes, chrysanthemums, and other bushes like Inkberry. As the spring thaw took off, and the plantings started to grow, the deer quickly mowed down and munched most of the plants in the garden. I knew that I had to change out those plantings as they were constantly being eaten and would offer no enjoyment to me. As I started to dig into the flower garden, I soon realized that the ground was full of cement chunks, rocks, and hard clay. It was then that I remembered that prairie plants could grow in clay and thrive in dry conditions. I even remembered that some of their roots might even help break up the clay. So I pulled out all of the previous plantings and started to plant my very own prairie garden. I absolutely love lavender, and although it is not typically in a prairie garden, it had to have a prominent spot in my garden. After I planted my lavender I went on to plant my prairie plants. I planted Tickseed Coreopsis, Yarrow, Purple Cone Flower, and Blazing Star Liatris. I then added some biannual black-eyed Susan seeds that re-seed every year. I eventually added a few herbs for culinary purposes as well. Over the past 10 years I have experimented and planted many different flowers in my garden, some made it and some didn’t. Those that were eaten by the deer were pulled out. As time went on the deer didn’t seem to bother eating the prairie flowers or herbs, and the garden started to flourish. I am always on the lookout for something unusual that would add a different appearance to the garden. My most recent addition was Verbena Bonariensis. I loved its airy, wispy, long stems topped off with purple flowers. I eventually expanded the lavender plants and purple cone flowers to the other side of my front flower garden. To that garden I added Calendula and Cosmos Mexican Aster Flowers. The garden gives me much enjoyment. I truly love to wander past my garden brushing my hands over the lavender and herb plants releasing their oils, and gazing at the numerous butterflies, bumble bees, honey bees, and pollinators busy at work in my garden. It’s my little patch of the prairie. We can’t thank Tricia enough for sharing her garden and landscape with us! Now it’s time to share your garden! We want to showcase gardens of all sizes and shapes. So no matter what you grow, how you grow it or where you grow it – send in your photos and short gardening story to This Is My Garden – and share it with the world. Simply email us at info@thisismygarden.com, or use the Share My Garden tab on the website. And be sure to follow us on Facebook and Instagram to get our weekly updates as well! That’s a beautiful testament to the love of gardening. Thanks for sharing. Thank you for the inspiration! I too have clay soil and a deer problem. I believe I will try your flower recipe in my front flower bed.